Our Properties For Sale What's My Property Worth? Steve has lived in Green Bay his entire life except for a few years while he was busy earning his Bachelor’s degree in Business-Marketing at the University of Wisconsin-Oshkosh. Steve’s exceptional communication skills, tireless work ethic and customer service mindset started at a young age when he would welcome and hold the door open for customers at Grand Openings for stores his parents owned. And that continues today working alongside his parents in real estate. 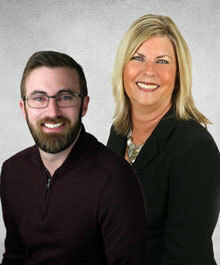 Steve’s expertise in the Green Bay market combined with his knowledge of the industry, his marketing background, and his desire to always leave his clients happy with their service make him an excellent choice as an agent when selling or buying a home. During Steve’s free time, he enjoys taking day trips around Wisconsin, trying out new restaurants, watching sports and watching movies with his friends, family and any furry pet that might be around. Click here to view Team Weber's Website.